Born in San Diego in 1951, she worked with young children as a bilingual preschool teacher for over ten years. In 1991, when she published her first book of songs entitled, Primavera, Primavera, Nuevas Canciones y Rimas para Pequeños, she had been diagnosed with chronic lymphocytic leukemia. While she battled the disease going through chemotherapy, she continued working eight hours, went to night school, and continued with her writings for her following books. Her efforts in producing beautiful and enjoyable songs for children and their teachers on themes for all the seasons became her most important goal. She published a second book and cassette of songs for summer: El Verano Vestido de Sol y De Color, Nuevas Canciones en Español Para Pequeños. Her third book and cassette is a collection of fun songs in Spanish to use during fall. The title is: El Otoño Ya Llegó y La Señora Ardillon, Mas Nuevas Canciones en Español Para Pequeños. Consuelo Maria used to say that writing the songs gave her a lot of joy because she vividly could imagine the children having fun with her songs, and that brought her immeasurable satisfaction. She also kept the teacher in mind in her writings. Her books were adopted by various school districts in the San Diego County area. She felt that songs in Spanish are needed for many themes and concepts, and to encourage children to love their language and culture. The songs express a special love and appreciation of nature, family, and that children are the most important, delicate, and unique part of nature. Songs, she believed, have to be written in a way that motivate children to participate actively during music and movement activities inside the classroom and outside in the yard. Consuelo Maria’s goal of producing a beautiful collection of songs to leave as a contribution for young children and their teachers was fulfilled. She lost her battle in October of 1998. Born and raised in San Diego County, she received her BA in Art at Cal State University, San Marcos (CSUSM). She is in a Master’s program at CSUSM. Her art medium is graphite and assemblage art, and she has presented her art throughout California. Amador began her academic career as an adult learner attending Palomar Community College. Joey Azul grew up on a small farm in Wisconsin with five brothers and sisters. She received her BA in Sociology from the University of California, San Diego. As a student she participated in campus activist politics. She also earned a Master’s Degree at San Diego State University. Joey is now preparing for a degree in art at Palomar and plans to transfer to a graduate program in Art. Ari is a former Palomar student in Chicano Studies. Born in Humacao, Puerto Rico, January 12, 1984. Moved to California in 1998 and started school in Center City High School. While she was in high school she started at Palomar College and finished high school at the age of 16. While in college she took several classes of photography, and three years later she was accepted at The Art Institute of California–LA to continue on her major Video Production before she went on to create the video and production company, Ferrer Productions. Born in Mexico City and raised in Escondido, he is currently working on a photography book based on Latino culture. He writes poetry and short stories from his cultural perspective. An undergraduate in I/O psychology program, she is a poet and a writer, published in literature magazines, such as Palomar College’s Bravura, CSUSM’s PLS, The Chiron Review, and HazMat Review. She served as host for Southwestern College’s Poetry Slam in recognition of Women’s History Month. Her lifelong dream is to teach underrepresented populations, so that they might find emotional health to strive toward upward mobility and life satisfaction. José was born in Mexico City, Mexico and was a member and president of MEChA at Palomar College. He earned a BA from Cal State University, San Marcos in Psychology with a minor in Visual and Performing Arts. He plans to teach at the high school level. José plays competitive soccer and enjoys the arts and is a leading member of the dance group Amigos by Legacy in Vista. José loves to write and enjoys school and is motivated to write a book in the future. He is currently director of the dance company Tierra Caliente in Vista, California. Enrolled as a student of Palomar College in Chicano and Chicana Literature classes, Fall 2001. Alex Martinez attended San Marcos High School and began his studies at Palomar College this summer. His major interests are creative writing, art, and journalism. Alex aspires one day to be a published author or art illustrator. 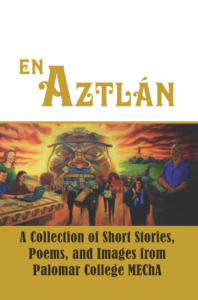 Ricardo Mendoza was an assistant professor of Chicana/o Literature in the Multicultural Studies Department at Palomar College in the early 1990’s. He received his Master of Fine Arts from San Diego University in creative writing. A former Palomar College student who graduated in June 2002 from CSUSM with a bachelor’s degree in Literature and Writing. Lisette plans to teach American Literature at the college level. She enjoys reading, and spending time with family and friends. She is completing a doctoral degree in Literature at the University of California, Riverside. Members from the student leaders La Raza Club in Vista, California. Yashuhiro Sahara comes from Hamamatsu City, Japan. He came to study in the United States in 1999, majoring in recreation. He plans to develop studies in international business and one day begin an import and export business. He enjoys the ocean, surfing, and girls. Carmen Solis was born in LaBarca, Jalisco, Mexico and came to live in Encinitas when she was eight years old. She enjoys writing, dancing, acting, and working with children and in the future is considering teaching as a career. A Palomar College student in Chicano and Chicana Literature classes, Fall 2001. Born in Lemon Grove, California, he eventually graduated from University of San Diego, majoring in philosophy and history. He attended UC San Diego as a doctoral candidate in literature before coming to Palomar College in 1972, where he has taught Chicano Studies, and has served as a MEChA advisor, and Chair of the Multicultural Studies Department. A member of the Oxford Roundtable, he has presented papers on Multiculturalism in America and American Foreign Policy, the oral history of the Mexican American community from the Mexican Revolution to World War II in Lemon Grove, California, and Cesar Chavez’ life and his fight for social justice. Professor Valdez is developing a documentary on the first successful desegregation court case won in March, 1931 in Lemon Grove, California.